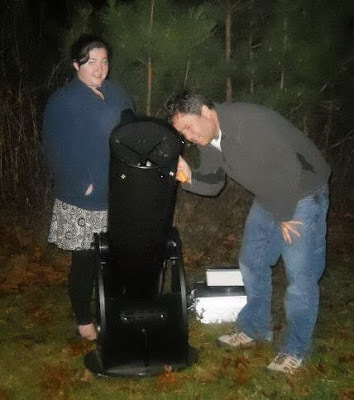 Even though we now have access to remote telescopes in various locations in the world where we have the ability to capture starlight and store it on our personal computers, there is also a way of enjoying astronomy as I did throughout the years and still do today. It is very exciting and rewarding to capture images of galaxies and nebulae, however, I still enjoy simply looking through a telescope and looking at astronomical objects visually. For example, while I'm logged into a remote telescope from my home office, I will have the 10" Dobsonian reflecting telescope set up in the front yard. class project - "Classifying Galaxy Types"
As I am imaging objects in New Mexico, perhaps I will be enjoying a good view of M81, the spiral galaxy in Ursa Major from my home. Sketching astronomical objects can be just as beneficial as imaging them. Our eyes can see details in astronomical objects visually through a telescope differently than an image can. I would like to share part of an article I wrote back in 1987 when I was Secretary of the Cape Cod Astronomical Society for its monthly newsletter. Its titled "The Real Joy of Astronomy - Observing". Interests in the night sky came about when man first looked up to notice a strange phenomenon. This was called "Starlight". Astronomy is one of the oldest of sciences known. It was curiosity, wonder, observation and thought throughout the centuries that brought us to the current understanding of the universe. It was with the most valuable instrument that humans started to learn the properties of heavenly bodies... The unaided eye. Observing is really what amateur astronomy is all about. I can recall the exact day I became hooked on astronomy. It was a warm spring back in 1975 that allowed my best friend and me to ride our bikes after dinner until the sunset brought on twilight. There was one particular night that detoured our attention from the earth and put it into the sky. Both of us were pedaling as fast as we could to beat the darkness that was quickly falling upon us to get home in time for dinner. As we turned down the last road before reaching our houses, suddenly there was a swift burst of light that caught the corner of my eye. My sense of curiosity forced me to stop instantly. When I took a good look at the spot where I saw the light, I noticed that the light was no longer there. The only thing that was there was a newly constructed house. My first and only thought was that it had to be a light was left on in the house. Not being convinced, I slowly backed up and there it was... the bright light. To my astonishment, it wasn't a light bulb at all. In fact, it was the waxing gibbous moon reflecting off the garage window. I had received a small refracting telescope made and sold by Sears Roebuck for Christmas the previous year. I was always looking for an excuse to get it out and use it and this was it! After pointing out the light source to my friend, Scott, I shared my idea of getting out the telescope and looking at the moon with it. Scott and I biked to my house as fast as we could with excitement and anticipation. 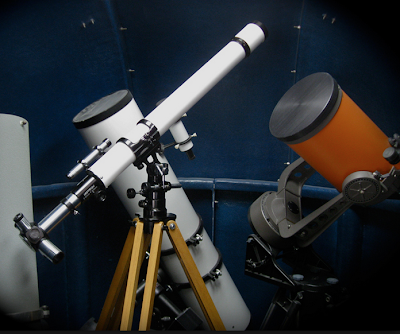 After carrying the small telescope out to the front yard, it was then my lifelong passion for astronomy began! As I pointed the telescope to the moon and focused the eyepiece, I couldn't believe my eyes. "Whoa!! You have to see this!" I shouted. As my friend Scott to peek, Scott yelled: "Look at all of the mountains!" It was a simple view of the moon that started a lifelong journey through the universe. It was visual observing that maintained a strong interest for myself in astronomy. In 1976 my family and I relocated to Cape Cod, MA. It was there I met Muir Evenden who's family had just moved into my development from Colorado. It was amazing that we discovered we both shared the same interest. As time went on, we both advanced our knowledge in astronomy in our own ways. While Muir used to read numerous books on the subject, I would enjoy viewing documentaries. However, there was one thing we always shared equally... Observing! Muir had his Celestron 8" SCT and I eventually acquired an Astroscan 4.45" wide-field reflector. It was Muir who showed me all for the first time through his C8, M31 - The "Andromeda Galaxy", M57 - The "Ring Nebula", and M13 - The "Great Globular Cluster " in Hercules. 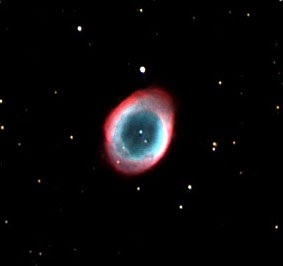 In exchange, I recall introducing Muir to M27 - The Dumbell Nebula. I recently asked Muir what he gets from observing... "When I find a Deep-Sky object for the first time, I feel a great deal of wonder, excitement and a bit of relief as if it were a big accomplishment. Observing, to me, is an adventure." It has been 27 years since I wrote this article for the CCAS Newsletter. It brought back a lot of fond memories of my observing adventures while transcribing to this blog post. My point of posting this old article is to convey how visual observing can be just as enjoyable and productive as gathering imaging from a remote robotic telescope. Both practices go hand in hand.